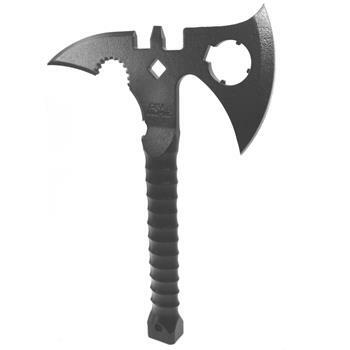 The DS Arms Z Hawk incorporates the standard AR15 armorers tools into one of the most already versatile tools on the planet, the tomahawk! The DS Arms Z Hawk enables you to perform a variety of gunsmithing actions to your AR15 rifle. AR15 based tools incorporated into the Z Hawk include the castle nut wrench, barrel nut wrench, flash hider wrench and A2 receiver extension wrench. The Z Hawk also accepts a ½ driver, has a bottle opener, base that can be used as a hammer and a lanyard loop. The Z Hawk is made from carbon heat treated steel and finished with an extremely durable powder coat finish includes protector head cover. Important safety information. This item is not a toy. This item is a tool. This item is inherently dangerous. This item should only be used as the manufacturer originally intended. This item has an edge and as such can potentially harm the user and others. DS Arms shall not be responsible for any misuse or damages as a result of misuse or the item being use in a way other than the originally intended purposes.